The definition of socialism varies a bit from source to source, but is essentially this: socialism amounts to collective ownership where the state owns and controls the means of production. Some sources offer more than one definition. "the stage of society, in Marxist doctrine, coming between the capitalist stage and the communist stage, in which private ownership of the means of production and distribution has been eliminated." ~ anti - "no free lunch"
A passage from the Bible says: "If a man will not work, neither shall he eat". Individual responsibility and a strong work ethic have been a part of every great nation since time began. Following is one of the best socialism definitions I think I've ever heard. Read it and ponder. "You cannot legislate the poor into freedom by legislating the wealthy out of freedom. What one person receives without working for, another person must work for without receiving. The government cannot give to anybody any thing that the government does not first take from somebody else. When half of the people get the idea that they do not have to work because the other half is going to take care of them, and when the other half gets the idea that it does no good to work because somebody else is going to get what they work for, that, my dear friend, is about the end of any nation. You cannot multiply wealth by dividing it." 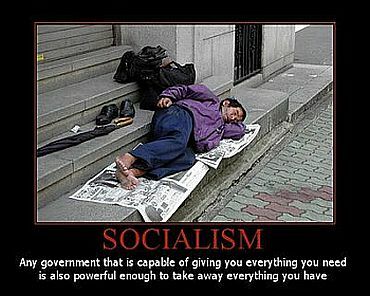 Let's not let the definition of socialism become the mantra of the USA government. Let your voice be heard in Washington, D.C. After all, the leaders are supposed to be representing YOU.